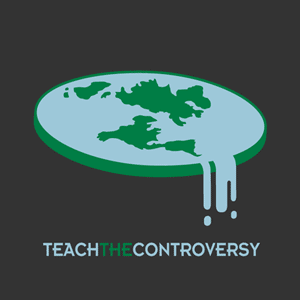 Image via Teach The Controversy t-shirts. But who are the Flat Earthers, and who is ignoring the scientific facts? In ancient times, the notion of a flat Earth was the scientific consensus, and it was only a minority who dared question this belief. We are among today’s scientists who are skeptical about the so-called consensus on climate change. Does that make us modern-day Flat Earthers, as Mr. Kerry suggests, or are we among those who defy the prevailing wisdom to declare that the world is round? There’s an important distinction that’s muddled here, between the Flat Earth Society (Kerry’s comparison) and the views of the ancients (McNider and Christy’s). The International Flat Earth Research Society was founded in 1956 (and relaunched as the International Flat Earth Research Society of America in 1973), and the Flat Earth Society of Canada was founded around 1971, becoming the Flat Earth Society in 1972. Kerry was clearly referring to these groups, which did the bulk of their work and came to public prominence after satellite images of the decidedly spherical Earth had been widely publicized. These groups are a major theme in Worlds of their Own, a collection of essays by former president of NCSE’s board of directors Bob Schadewald, who befriended IFERSA president Charles Johnson and (for ethical reasons related to his knowing that the earth isn’t flat) declined the offer to take over the society’s presidency. McNider and Christy prefer to take the discussion back to “ancient times,” when they allege there was a “scientific consensus” about a flat earth. Christine Garwood reviewed that history in her comprehensive history Flat Earth: The History of an Infamous Idea. She notes that the idea of a flat earth is common in Middle Eastern religious cosmologies, including the ancient Egyptians, Sumerians/Babylonians, and early Hebrews. The ancient Greeks held a range of views on the shape of the earth, with some considering it flat, while others insisted it was cylindrical. Aristotle suggests several proofs of the planet’s sphericity, including that sailing ships drop over the horizon gradually, hull-first, as well as the shape of Earth’s shadow on the Moon, and the shifting arrangements of the stars at different latitudes. A few early Church Fathers attempted to offer defenses of a flat earth based on allegedly literal readings of the Bible, but they were not influential. Indeed, Garwood argues that these rare voices have been dramatically over-emphasized by later writers trying to construct a narrative of a conflict between science and religion. By the time of the Scientific Revolution and the Enlightenment, there was no educated dispute about the shape of the earth, though estimates of its size still varied. Columbus’ novelty didn’t rest in advancing a spherical earth, but in proposing a size for it that was far too small; this strategic misestimation was necessary to justify his belief that well-provisioned ships could reach the Indies by sailing west. I think we can safely regard the flat-Earth cosmologies of the ancient Middle East as pre-scientific, and not reflecting a scientific consensus of the sort that McNider and Christy are talking about. The debates over the shape of the Earth that prevailed through the age of the Pythagoreans were also not primarily scientific. Indeed, it’d be about 2000 years before anything we’d recognize as science and true scientific discourse really became established in the West. Aristotle, Thales, and other Ancient Greeks set the stage for science and established some critical early results, but the notion of scientific consensus—a shared vision among a community of scholars united through a process of peer review and valuing evidence-driven, repeatable, testable hypotheses—would have to wait for a few millennia. In summary, then, there was probably never a scientific consensus that the Earth was flat, and that idea was first overturned not by science, but by a different philosophical system. Any lessons for modern climate science in that history 2500 years ago are hard to identify. McNider and Christy are thus wrong on the science, and root their claim to being revolutionary scientists in a misreading of the history of science. On the other hand, John Kerry’s analogy between the modern flat earth and climate change denial movements is instructive, a theme I’ll pick up in a later post.